These spinning wheels are typically in stock and available for sale on Amazon.com. In compiling this list of the top 4 entry-level spinning wheels we took into consideration the following factors: price, ease of use, brand reputation, and quality of construction. ​We feel these are the most important factors to consider when shopping for a spinning wheel for beginner hand-spinners, but other considerations you might be interested in are appearance, portability, size (footprint and weight) and more. Your handspun yarn might not be perfect, but your first spinning wheel can be! We'll try to discuss all of these factors for each wheel listed below so you can make an educated choice when selecting the best spinning wheel for you. Ashford is known as one of the most respected spinning wheel manufacturers, producing simple, well-built spinning wheels that can last forever if properly maintained. The Ashford Kiwi Spinning Wheel which is our top pick is simple in its design, comes unfinished (you can choose your favorite wood stain to give your wheel a custom look if desired) and has storage space for extra bobbins, making it easy to keep spinning if you run out of room on your current bobbin, or to ply two different yarns you've spun together. The two-treadle design is popular with beginners as it helps you maintain good positioning and rhythm, and the small footprint of this wheel makes it easy to store or set-up in front of any chair in your living room or at the fair. It's also pretty light-weight and easy to transport ... in most cars you can buckle it right into the passenger seat if you're joining a local spinning group. It's a great investment at around $450 and you can purchase it on Amazon with free shipping. You may be surprised that such a beautiful, Saxony-style spinning wheel costs under $450, but the Unfinished Kromski Prelude is a wonderful and affordable entry-level spinning wheel. This unfinished version (like the Kiwi above) allows you to choose the stain and finish that you prefer (though it also comes pre-finished with a higher price-tag). With comfortable ratios (6:1, 10.5:1, 13:1) and an attached Lazy Kate, learning to craft your own handspun yarns is a breeze on the Prelude, and since this wheel only weighs 9 pounds it's surprisingly portable. Unlike some of the upright wheels on this list, the Prelude is a showpiece once stained, so you don't have to worry about putting it away ... you can keep it out in your living room and it will enhance nearly any decor as a terrific conversation piece. 3 Bobbins are included when you purchase the Unfinished Kromski Prelude online at Amazon, where it ships for free. What we love most about the Ashford Traveller Spinning Wheel isn't necessarily its looks (though the natural finish does offer a simple, classic look), but its versatility and how easy it is to use. 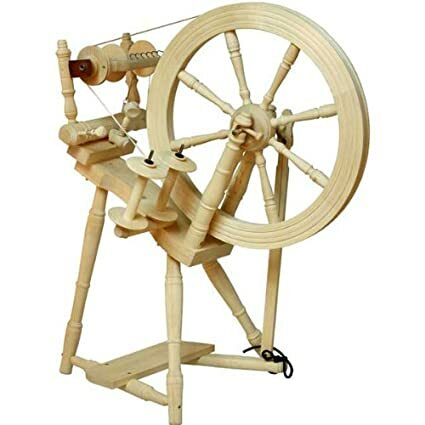 This single-drive, double-treadle upright spinning wheel accommodates a number of different attachments and bobbins, making it very versatile. It's also lightweight, weighing in at only 18 pounds which makes the name (the "Traveller") apt. This is a great spinning wheel to take with you in the car to spinning class or a fiber arts group, or even on vacation to spin lakeside. 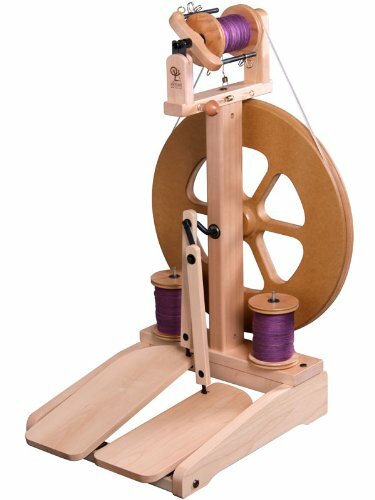 With 3 drive ratios, this wheel makes it easy to spin nearly any type of wool or wool blend, and its dual-treadles are hinged beautifully, making it very easy for the beginner to start and stop the wheel. While it is more expensive than the two spinning wheels above, we think it's worth the price on Amazon. Adorable, lightweight, and easy-to-use, we love the look of the Ladybug spinning wheel from Schacht! What is most striking about the Schacht Ladybug Double Treadle Spinning Wheel is its appearance. Schacht spinning wheels are known for their solid construction and durability, and while we like some of their other wheels, the Ladybug stands out with its two-tone color palette, offering a fun, festive personality. While the Schacht wheel is heavier than the Ashford Traveller (45 pounds vs. 18), we think it's still pretty easy to move around thanks to the thoughtfully placed handles (you can see them just behind the wheel, on either side of the upright piece). There's also a 4-spindle Lazy-Kate attachment designed for this wheel which is optional, which we recommend purchasing if you invest in this spinning wheel (the most expensive on our list). While there are many more expensive and fancier spinning wheels available, if you're looking to purchase your first wheel, we feel that each of the four entry-level spinning wheels above are solid options which will allow you to spin beautiful yarn without going overboard on price until you're sure that hand-spinning is a craft you love and plan to continue with for the long haul. With that said, a spinning wheel is a beautiful investment and they hold their value well if properly cared for. There are always people nearby who are looking for used spinning wheels for sale, so if you find a terrific spinning wheel that you fall in love with, don't be afraid of investing a little extra in getting exactly what you want. I'm also of the opinion that once you're an avid hand-spinner it's worth having two wheels - a high-end wheel that you use at home, and a less-expensive, portable spinning wheel like those mentioned above, which you can take with you if you travel to a fair, fiber festival, or a spinning group. Do you have an opinion on what is the best spinning wheel for beginner or first-time hand-spinners just learning the craft? Leave a comment and let us know! Editor's Note: This article was originally published in October, 2016. We have updated it to be more accurate, comprehensive, and relevant to our readers.